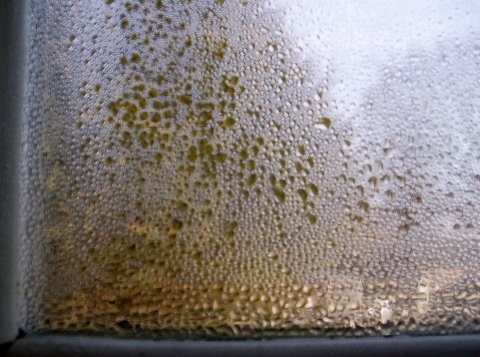 Window Condensation occurs when the indoor temperature at the window drops below the dew point, caused by . . . Window condensation occurs when the temperature of the window frame or pane is less than the dew point of the indoor moisture vapor. It can be caused by single-pane windows, little or no exterior wall insulation, low indoor temperatures, or high interior moisture. It’s usually a combination of these things. Sources of Moisture Vapor. Without any help from the weather, we who live in houses are pretty good about filling them up with water vapor. We cook. We clean, We breathe, We sweat. We bathe. And, if that isn’t enough, we grow plants, care for animals, maintain aquariums, and dry clothes. Occasionally, we have an unlucky plumbing leak. Don’t forget toilets have water to evaporate too. Good whole-house and spot ventilation can easily take care of these sources. To get whole-house and spot ventilation to work effectively, we can’t overwhelm them with unnecessary sources of moisture—the vapor that comes in from outside. Humid air comes in through holes in walls, floors, and ceilings—the shell. It also come in the leaks in ductwork. We don’t think about it much, but it also comes in straight through our walls—but nowhere near as much as it does through holes. The cruelest and foulest source of moisture comes through foundations and crawlspace soil. If you or your friends have ever complained about a damp basement or a house that smells like the crawlspace, you know what I’m talking about. After the water gets in, it evaporates. The air is then drawn through the floor when air escapes the attic. Reducing the amount of outdoor sources of moisture results from air sealing, installing crawlspace vapor barriers, and managing rain and groundwater flow. The Trick. Eliminating moisture on windows results from lowering indoor relative humidity. The choices are increasing temperature, reducing moisture vapor, or both. Single-Pane Windows. The reason single pane windows allow condensation to occur so easily is because the window is the outdoor temperature on one side and indoor on the other. When indoor moisture is high, it doesn’t have to be too much cooler to get the window to the dew point. Put curtains or shades in front of the window to make it easier still. Multi-pane windows work because one window pane is cold while the other one is warm. The air gap in between makes is insulation. The solution is to either install multi-pane windows or storm windows. Insufficient Wall Insulation. Cold exterior walls don’t help matters either, because it cools the air reaching the windows. Don’t forget that warm-moist air condenses on walls too, especially behind anything pushed up against them: furniture, bedding, boxes, clothes, entertainment centers, pictures, etc. Insulating walls helps keep the overall temperature in the room higher, leading to a drier room. Relative humidity is a function of indoor temperature. 90% RH at 40°F becomes ~40% RH at 68°F. As a temporary measure, a dehumidifier needs to keep the house below 50% RH. Then the thermostat set at whatever temperature. However, you’ll be a lot more comfortable in your home at 68°F or more, depending on your age and health. Air sealing, duct sealing, and ventilation are critical. Behavioral Choices. The way we live in our houses has a lot to do with the indoor moisture levels, and consequently the moisture on windows. We can reduce it with lifestyle changes. I’ll talk about those another day. However, I’d be happy if you’d start using your bath area vents—you know those loud, noisy things that don’t turn themselves off? How about replacing them with quieter ones that work with sensors or timers rather than on-off switches? On my websites are several sources of information about controlling moisture vapor, which leads to window condensation. They include diagnosing and correcting air leaks, duct leaks, insulation, ventilation, and window performance. Here’s an excellent article from a windows manufacturer, who reminds us that windows don’t cause condensation, so windows alone can’t fix it. Plug “Window Condensation” in to the search box of your web browser for a lot more info. I just took a class about one of the greatest sources of moisture vapor in our houses. Next time, hot water!